THREE RIVERS — Throughout the 60s and 70s, Gordon Lightfoot’s touching music and relatable lyrics cemented him as perhaps the greatest Canadian singer-songwriter of all time. With authentic instruments and equipment previously used by the Gordon Lightfoot Band, as well as countless mentoring from Lightfoot himself, Mike Fornes and four other Michigan musicians will demonstrate Lightfoot’s timeless songs, and lay the role of his band members as the “Whispers of the North,” Gordon Lightfoot Tribute Band, when they perform at the Riviera Theatre this Friday, July 20 at 8 p.m.
Fornes, retired radio and television play-by-play announcer for the National Hockey league and professional baseball, will play Gordon on stage, and said reenacting the iconic group “doesn’t come easy”. Fornes and four other band members, who will also portray band members from the original band, have committed to being “detail-oriented”. ” I am not Gordon Lightfoot, I am just a pinch hitter,” Fornes said. 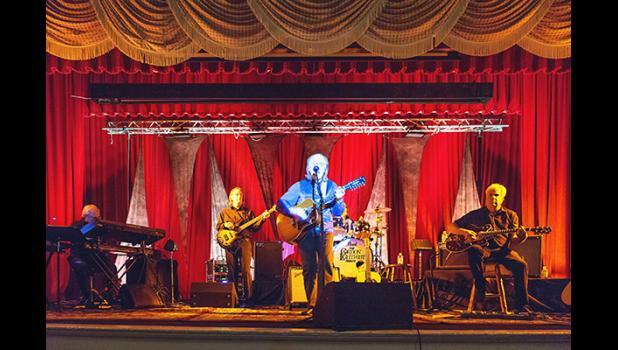 Fornes said his tribute band rehearses countless times in an attempt to perfectly represent the Gordon Lightfoot Band onstage, as well as create sounds that are almost identical to the original records. Fornes recalled a time when the band’s keyboardist, Mike Heffernan, spent nearly 90 minutes setting up a keyboard to be played by the tribute band. During his performances Fornes makes time in-between songs for storytelling. He tells tales to the audience that were told to him directly by Lightfoot on the real meaning and purpose behind Lightfoot’s songs. “I do a lot of storytelling about how the songs were written. There are things about the songs that the audience doesn’t know. Maybe they misinterpreted it, or maybe they just have not realized what the song was ‘really’ about. Some of the words were written for a reason, and my own interactions with Gordon have been a big help with that because he shared some things with me,” he said. Fornes said the Riviera Theatre’s “delicate” setting will allow the band to interact closer with the audience. He said the audience can still expect “toe-tapping” songs, as well as Lightfoot’s top songs such as the “Wreck of the Edmund Fitzgerald”, “If You Could Read My Mind”, and “Rainy Day People”, but the “aesthetics” of the Riviera may bring out a more touching side of Lightfoot. “This aesthetic allows you to get into some things that probably really touched somebody back in the day when they were listening to these albums,” Fornes said. About 11 years ago, Fornes’ journey playing tribute to Lightfoot began as a “dare”. Fornes said the 582-seat Cheboygan Opera House was falling on hard times financially, so he and other area musicians came together to perform a show to raise money for the opera house. “We sold it out, and it was such a fun time that we did it again,” he said. Now, in addition to the band’s tours, Fornes said they play the Wreck of Edmund Fitzgerald during the annual bell ringing ceremony at the Great Lakes Shipwreck Museum in front of family members of those who lost their lives during the tragedy. Every year on Nov. 10, the tribute band performs the classic song, and each time Fornes says it’s a “humbling experience”. Tickets for Friday’s show are $25 at the door and $20 in advance, and can be purchased online or in-person at the Riviera Theatre ticket office.